There can never be enough BBQ restaurants in town. That said, I’m always skeptical when a new one opens. The shops that try to look slick are usually the ones where you get the least amount of food for the price. I got really excited when I noticed a new place in downtown Kalamazoo. It had all the right words associated with it. BBQ. Brisket. Pork. I was driving by every time I went downtown to see if it was open yet. A few weeks ago, the time finally came. 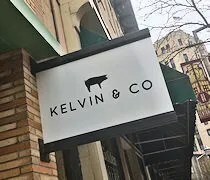 Kelvin & Company opened it’s doors. We weren’t the first ones in line because we were in Chicago that weekend. The next weekend, we had family in town, so it took until almost the third weekend of the place being open before we finally stopped in for lunch. Kelvin & Company is on the very busy Michigan Avenue just after the curve at Portage Street. It takes over a space that was the Main Street Cafe for many years. A lot of work has been done since the cafe closed a little over a year ago. The new owners describe the look as an industrial modern motiff. 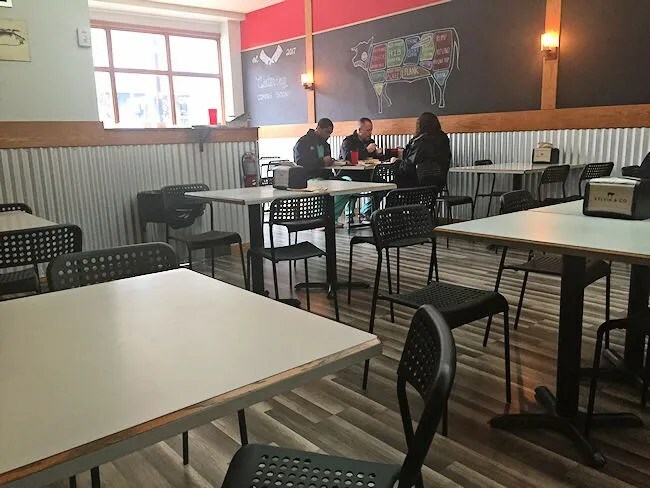 They’ve put in hardwood floors, chalkboards on the walls, and galvanized steel below the chair rail. The restaurant is set up as a quick service establishment with a fairly large dining room that filled up pretty quickly on the Thursday afternoon we stopped in to eat. The menu at Kelvin & Company is pretty standard BBQ, but with flare. They only use antibiotic and hormone free beef which is slowed smoked. 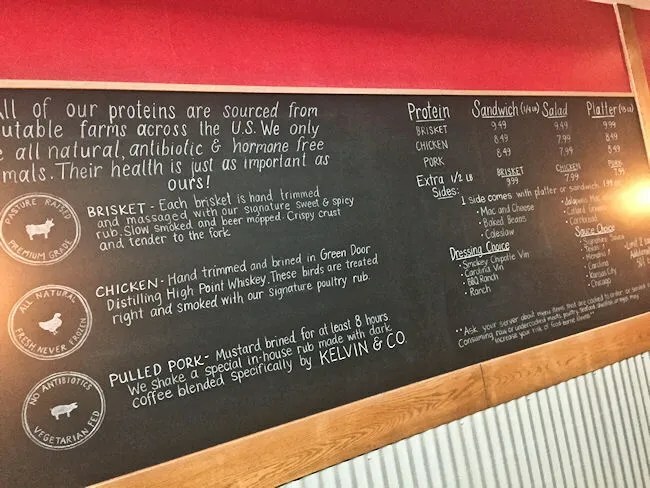 The pork and the chicken are both brined….the chicken using Green Door Distilling’s High Point Whiskey, and the brisket is mopped with beer. You have the choice of how you want the meat. The three options are sandwich, salad, or platter. The platter and sandwich comes with choice of a side and one sauce while the salad comes with choice of dressing. Those sides, dressings, and sauces are all crafted in house. Ordering is done at a counter near the back of the space where the meat is cut or pulled right in front of you. The plates are assembled and sides are added in recycled paper cups then passed down to a cashier at the end of the counter. The whole process takes less than five minutes. We must have just beat the lunch rush. There was no one in line when we walked in, but one formed quickly behind us. J and I each stuck to our typical BBQ orders. 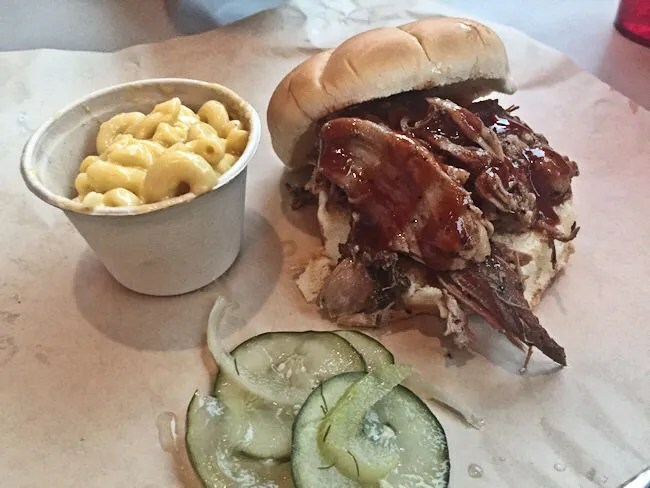 I got a brisket platter with jalapeno mac & cheese while she got a pulled pork sandwich with mac & cheese. We also got an extra side of mac & cheese for the kids and a couple of drinks. The total bill came out to just a little over $25. After I got Coke’s from the fountain machine, I started right in on the brisket. The platter portion is a 1/3 lb. which gave me three decently thick slices. All of the slices seemed to come from the fatty point which made the brisket just melt like butter. The meat had a really salty crust and a delicious pink smoke ring just underneath it. I’ve always been such a huge fan of Arcadia Ale’s brisket, but this one will give them a run for their money. I had a hard time stopping with the brisket, but I wanted to get to the jalapeno mac and cheese. 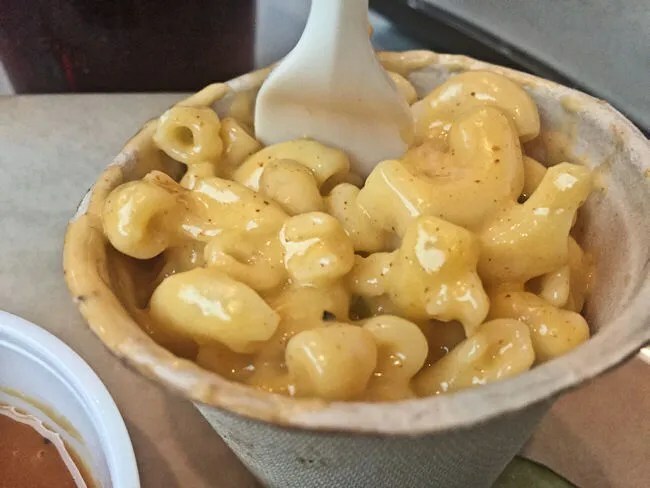 The cups are a little small, but they pack in a flavor, spicy, but not overpowering mac and cheese until it’s overflowing from the paper cup. There are no visible jalapeno’s in the mac and cheese other than some pepper flakes in the cheese sauce, so the spiciness kind of surprises you….in a good way. J got the pulled pork sandwich. The meat was super tender and was drizzled with their signature sauce. You have the choice of sauces, but I thought this would be the one J liked when I ordered. It was slightly sweet, but not spicy like the Memphis sauce I got. The sandwich comes on a dense brioche bun. J typically prefers pulled pork with a lot of sauce, but this is one of those that is so tender and so flavorful on it’s own that the drizzle of sauce was a perfect compliment but didn’t overshadow the meat. J’s side choice was the mac and cheese. It was served the same way as the jalapeno mac and cheese was for me and it was basically the same pasta dish without the spiciness. We also got an extra one for the kids and unfortunately, it comes in the same size cup. Both kids liked it and they were fighting over the small cup, so I went back to get another one. The other thing that comes on all the plates is homemade pickles. These thinly sliced cucumbers still come with the fresh herbs they were made with. 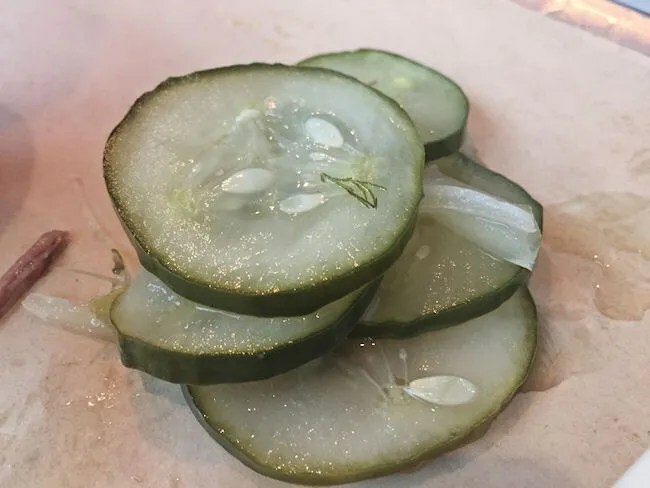 They have more of a cucumber-y taste than a pickle taste. The brine is subtle but packed with flavor. 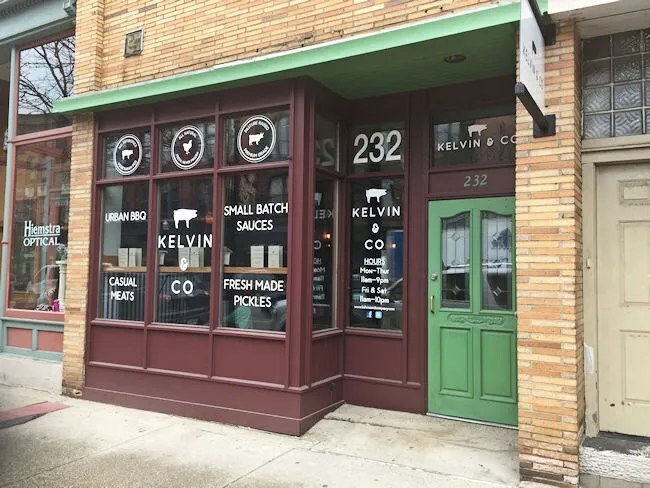 Kelvin & Company is just what downtown Kalamazoo needs. 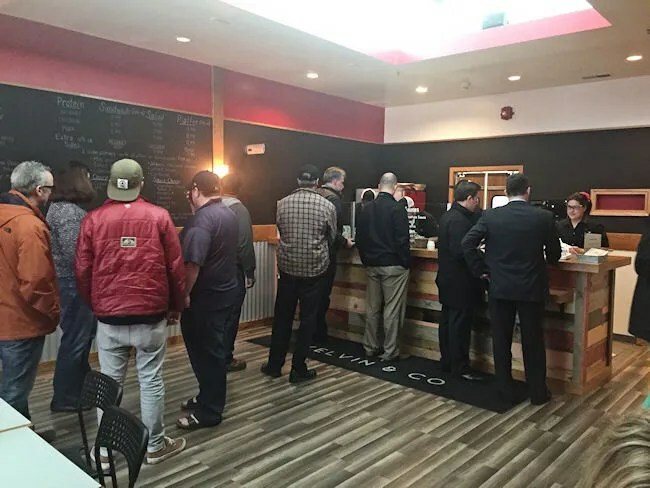 The fact that it’s a quick service restaurant in downtown is great on it’s own, but the food is something pretty special. The meats were all amazingly seasoned, brined, rubbed, mopped and smoked. The sides were all fantastic as well. I wish the portion size was a little bigger, but that’s the way it goes at BBQ places. Kelvin & Company seems to have quickly found a following in downtown Kalamazoo and J and I will add to that. This is the kind of BBQ place I’ve been longing for in the area. I still love what the two breweries down the road do with BBQ, but the more choices we have, the better off and more well fed we’ll be. I’ve been a BBQ fan since forever and started smoking my own meats around six or eight years ago. 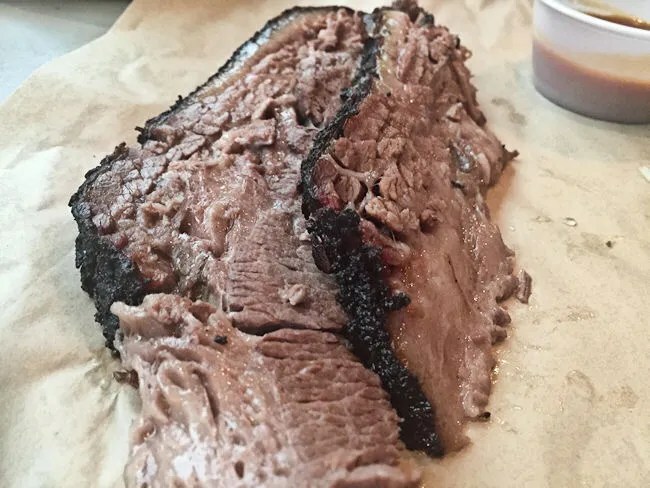 I always judge a BBQ joint based on their brisket. I rate Kelvin & Co. at the top followed by two close finishers, Barrett’s Smokehouse and Arcadia Ales (in that order). It wasn’t that long ago that there was NO good BBQ in Kalamazoo. I agree. When I moved here 7 years ago, there was nothing. I love that there are choices now!